The Who’s Tommy is considered one of the greatest concept albums of all time, but it has taken the 50 year old group nearly that long to perform the double album live in its entirety. Tommy Live A The Royal Albert Hall comes to DVD, Blu-ray, 2 CD and 3 LP via Eagle Rock Entertainment today (Fri, Oct 13th). This unbelievable concert film captures the first-ever live performance by The Who of Tommy in its entirety and boasts over two hours and twenty minutes of content from the famed London venue in April 2017. “I mean, Tommy for me, personally, it was the thing that broke my shell, especially vocally. It’s that kind of piece. It’s nothing to do with notes. It’s got more to do with the sound within them,” recalls vocalist Roger Daltrey during the film’s opening. As one would expect from such a complicated collection of music, the group used charts during the performance. The songs were often sequed together to reflect the album with a few pauses in between. If the listener wasn’t familiar with the album, they may be confused when one song ends and another begins, but that’s their problem. The eight piece group is polished and sounds like they’ve been performing them their entire career. The concert is visually stunning with a variety of video effects gracing the large three-dimensional screens behind the band. In fact, the visuals often tell their own abstract stories as the band chugs along. As a bonus feature, fans can watch “The Acid Queen” and “Pinball Wizard” screen footage separately. The lighting they used is something you don’t see to often. Instead of just lighting the stage, the entire venue and audience are lit with themed lighting that includes blue, green, purple and others. It makes for a very unique and cool presentation. 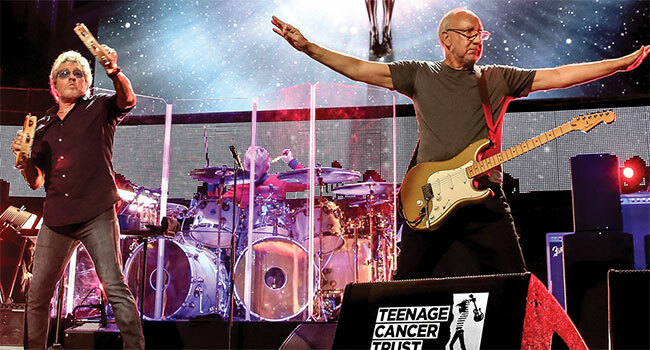 Gracing the stage with founding members Daltrey and Townshend are Townshend’s brother Simon on guitars and backing vocals, Ringo Starr’s son Zak Starkey on drums, Jon Button on bass guitar, Loren Gold and John Corey on keyboards with keyboardist Frank Simes serving as Musical Director.